You are browsing the Blog for trussel trust. Difficulties often come hand-in-hand, like poverty and the use of food banks. This week saw the kick-off of our food banks campaign, which is something we’ve not looked at in any detail in my many several some years with GU Amnesty. 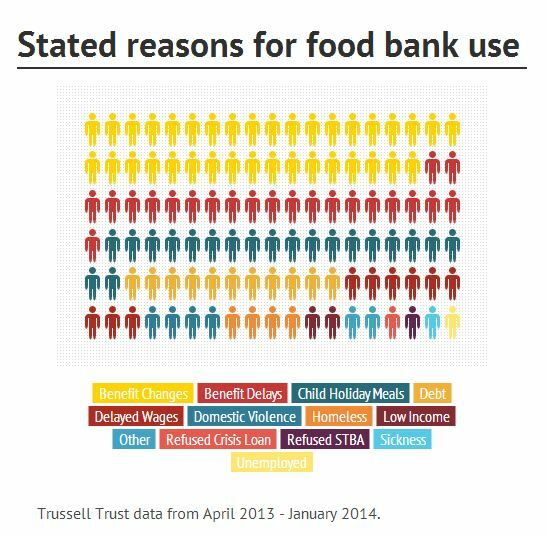 Way back in the campaigns meeting one of the reasons suggested in favour of choosing food banks as a campaigns was the locality of the issue: in 2009 there was one Trussel Trust food bank in Scotland; in 2013 there were 42, with another 17 in development (1). Recent public events in Glasgow have seen en-masse donations to food banks, underscoring a level of interest and appreciation of the issue from the public. At least, that’s the hope. In Scotland food banks and related services have expanded greatly even in the last few years. The issue is both huge and uncomfortable. In the UK, mobdro free download estimates put the proportion of the population below the poverty line at 1 in 5. This is nearly 13 millions people, or nearly two-and-a-half times the population of Scotland. Those numbers are shocking, but can be hard to relate to; so let me put it a different way. Let’s say there were around thirty people at the meeting on Tuesday. If the group is representative of a national average (which I don’t think we are, but that’s not important here), it would be likely that one or two of the people you were sitting with at your group’s table is in poverty. Now, there’s admittedly a fair amount of hand-waving and inaccuracy in there, but the point is: one in five in poverty is huge. Not quite as large but just as uncomfortable is the number of people using food banks in the UK. Sources put it at around 1 million, and we’re not alone: compare with 1.5 million in Germany. That’s a million people who most likely have a choice between a food bank, or going hungry. A choice between going hungry, and the potential social stigma associated with using a food bank- to be accused of being ‘too lazy to work’; ‘wanting something for free’; or the loss of pride felt at being unable to provide for themselves and their family. These aren’t choices any person anywhere should have to make, much less in the prosperous UK. It’s bad enough that the UK has been accused of violating the basic human right to food as a result. Why have we gotten to this stage? One of the common definitions of poverty, includes those living at or below 60% of median household income (2). While this is both somewhat arbitrary and indirect, it would in itself point to a reason that an ever-higher proportion are in poverty: widening income disparity. But this still says next to nothing about the causes of poverty. There is a veritable laundry list of reasons put forward: disability, illness, racial discrimination, lone parent, or simply a person being born into poverty means it’s much more likely that they will remain in poverty. Tougher financial times will also have a significant impact on the standard of living, disproportionately so at the bottom end of the scale. One of the big reasons that came up in both videos we saw (Breadline Britain and Julie Webster discussing Maryhill Food Bank) was that benefit changes, reductions or even delays mean people are put in a situation where they may have to seek help with food. I could continue to quote statistics from the meeting we had on Tuesday – 4 million kids Mobdro Online TV living in deprivation; 2.5 in damp homes; 1.4 in homes that aren’t adequately heated; it goes on – but the case is clear enough. Fortunately, as ever with our campaigns, we can do something about this. This being a campaign with a very local focus, we can perhaps do even more than we could otherwise. It was extremely heartening to see both the generosity of food donated, and the enthusiasm for continuing to drive this forward. Breffni O’Connor voiced both her and the SRC’s support for widening the campaign for food donations; both she and others had some great ideas for how to go about this. There is potential for Glasgow University to come together and do something meaningful and of tremendous benefit to the community. I really hope we do. Newsletter 2015-02-17: SCOTTISH STUDENT CONFERENCE AND SPB THIS WEEKEND! Glasgow University Amnesty International is proudly powered by WordPress and BuddyPress. Just another WordPress Theme by Themekraft.